You, the yellow stick, is stuck between two castles. There is no way for you to get out, but you can try to head the yellow ball out and hope someone will notice that. You need to head three balls out within the time limit. Otherwise, your destine is doomed. Almost forgot, you can actually change your shape, and your weight is actually related to your size. That said, the smaller you are, the higher you can jump. 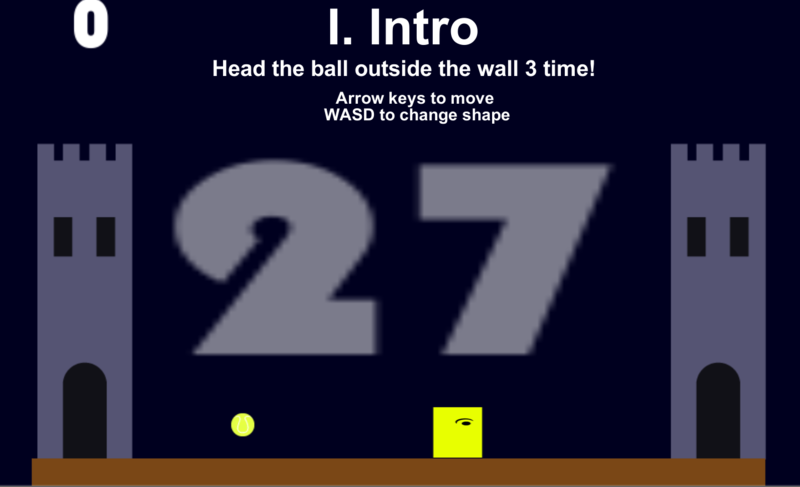 This is a school project that requires us to modify, The original game is a horizontal breakout which players need to keep the ball bouncing between the castle and the yellow stick. I decide to change the goal in a totally opposite way, and I add variations to different levels. 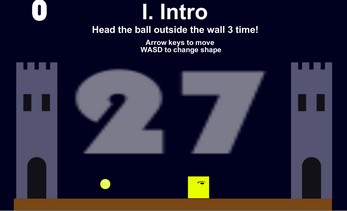 For example, the second level will shake the screen, while the third reverse the gravity. After I change the goal, the game becomes more interesting, since you need to jump and head the ball when it was right on top of you. In order to realize that, I add the ability for players to change the shape. After introducing that mechanic, I decided to link the height of the jump with the size of the shape in order to balance out the advantage provided by large shapes.